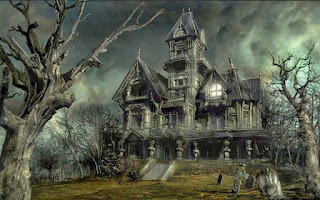 It's been awhile since I've done a Top 10 Tuesday here on Theresa's Haunted History, but this week its appropriate! If you read yesterday's blog, you know that I'll be on Paraversal Universe Radio this Friday (22 April 2016 at 8pm EST), discussing the world's most haunted places with Gavin Lee Davies and Jason Bland. Each of us were asked to compile our own list of the ten most haunted locations throughout the WORLD, so we can compare and discuss on Friday. Ya'll know how hard it was for me to come up with my top 50 locations in the United States! The task of narrowing down just ten locations worldwide is overwhelmingly difficult, firstly because how do you even gauge the 'hauntedness' of a location? Until we fully understand the mechanics and the reasoning behind a haunting, and start producing evidence that holds up to scientific scrutiny, the subject is largely...well...subjective. Therefore, my list is going to be pretty subjective, and quite honestly, probably a little ethnocentric, ie, heavy on not only American locations, but locations within or near the tri-state area! 1. How popular or well known is the location? Do people hear this location's name and automatically associate it with ghosts and hauntings? 2. How often has it actually been investigated or explored? Do those who investigate this location find consistently 'good' evidence that stands up to peer review? Do visitors routinely report experiences? 3. What are the stories associated with this location? Why do people believe this place is haunted to begin with...and how much of it is supported by historical documentation? 4. How intense is the suspected paranormal activity? Is it truly frightening? Does it happen on a regular basis? How likely are you to actually have an experience or capture potential evidence at this location? 5. Duration: How long has this place been known to be haunted? Are the stories and/or experiences new, or have they been around for awhile? One obvious omission from the list is any examples from the continent of Africa. In a place of some pretty violent history and where people are still put to death over allegations of witchcraft, I honestly cannot think of any locations that would fit my criteria off the top of my head. I think I foresee some investigative research and a series of blog posts coming up soon about this! Anyway, let me know what you think of this list! I've still got a few days to make final changes, so hop on over to Facebook and give me your thoughts. Happy Haunting!